Posted on Sat, Feb 11, 2012 : 5:46 a.m. I suppose it’s true, happily true, that Robert deMaine is “old news in Ann Arbor,” as he wrote in a recent e-mail. The town knows him as the superb principal cellist of the Detroit Symphony Orchestra; as a chamber musician; a soloist; and as a composer. This Friday, meet deMaine as the cellist of the Chroma Piano Trio, when the group—which also includes violinist Nurit Pacht and pianist Priya Mayadas—makes a Kerrytown Concert House debut in a concert of works by Beethoven, Dvorak, Bloch and Suk. 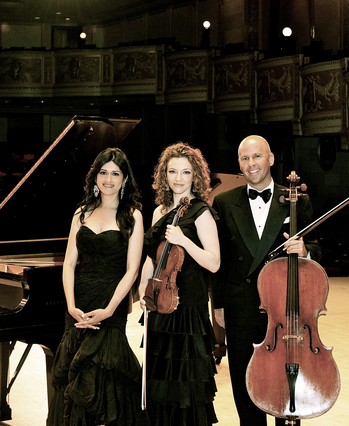 The three players, all of whom have prominent recital, orchestral, and chamber music careers, first came together when Pacht assembled the group in 2010 to perform on her series, “Double Take,” at the Pierpont Morgan Library in New York. “We enjoyed playing together so much that we decided to take it to the next level and become a regular trio,” deMaine wrote in an e-mail from Seattle, where he was performing in concerts of the Seattle Chamber Music Society. The reviews—glowing reviews, from the New York Times and other media outlets—began pouring in, the phone started ringing, and the three have been playing together regularly ever since. This spring, the group has concerts in New York, Vermont and on deMaine’s own “Classical Brunch” series in Birmingham. Plans for a mini-festival are in the works, deMaine said. What: Music of Beethoven, Bloch, Dvorak, Suk. Where: Kerrytown Concert House, 415 N. Fourth Ave. When: Friday, Feb. 17, 8 p.m.
How much: $10-$30. Reservations available by phone to KCH, 734-769-2999, or online at kerrytownconcerthouse.com. House doors open at 7:30 p.m.
That mix is representative of the trio’s breadth. “We have a particular affinity for the off-the-beaten-path repertoire in addition to the standard works for piano trio,” deMaine said. As examples of off-the-beaten-track pieces, he offers Eduard Steuermann’s arrangement of Arnold Schoenberg's “Verklarte Nacht” and Beethoven's own arrangement of his Symphony No. 2 in D.
“We also are deeply committed to performing the works of contemporary American composers,” he added. Like deMaine, who is also active as a composer, pianist Mayadas has a very distinguished background as a composer; as a child, she became one of the youngest winners of the BMI awards for writing a string quartet. She has performed to great acclaim throughout the U.S. and abroad. Ditto for violinist Pacht, winner of several important string competitions and a passionate particpant in early music and the historically informed performance movement. That both Pacht and Mayadas have New York as their base is not a problem for Michigan-based deMaine, whose New York connections include years of studying, living and working there himself. It’s a great alliance, and KCH should be a great venue in which to hear the Chroma program. For a preview of the Beethoven, go to chromapianotrio.com, and enjoy what’s coming our way.